About 60% axon captured, 95% dendrite captured. 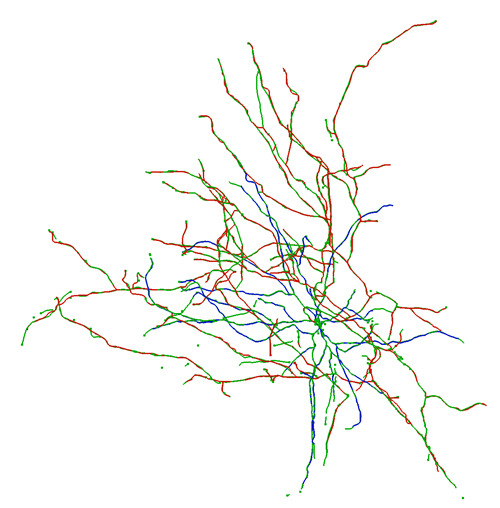 One major branching error in the dendrites. A small amount of false positive captured, mostly in the lower right area. 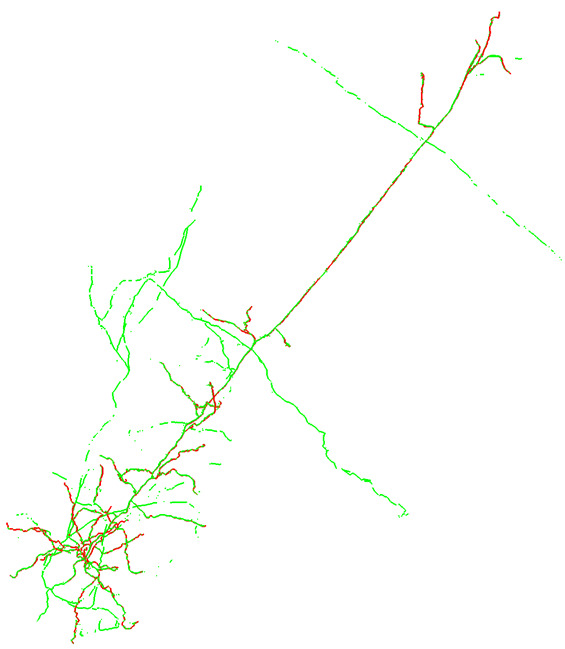 In the image below, gold standard is red (axon) and blue (dendrite); consensus is green. The reconstructions and the MIP image are not to scale. I’m very impressed with this one. 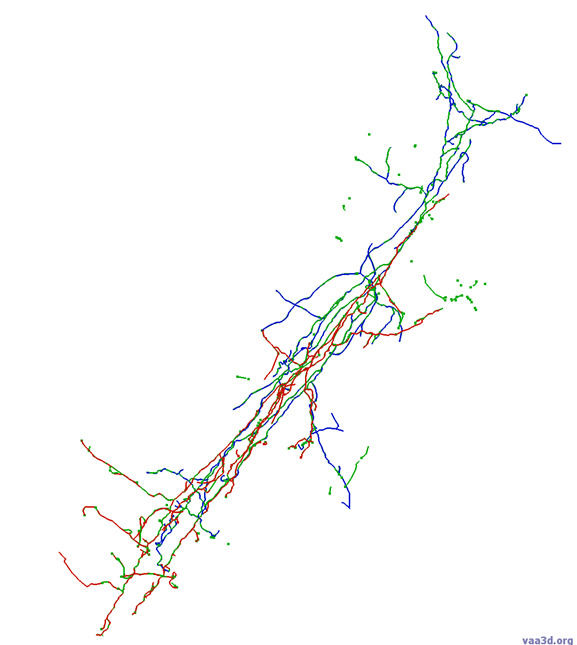 About 90% axon captured (and a couple short segments we probably missed), 99% dendrite (one minor error, but also a couple of dendritic tips we missed). Almost zero false positive signal. Awesome! 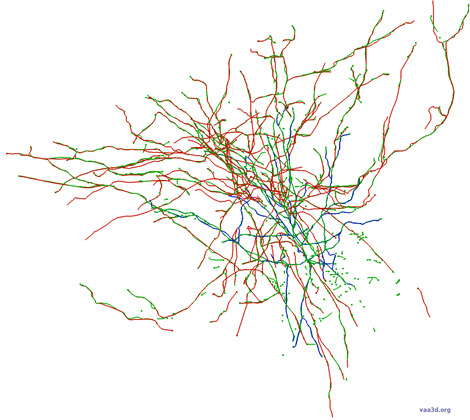 I would say about 75% axon, 85% dendrite (a couple of long bits missed. I missed them when directing people with comments). Still pretty good overall. A few false positives, but not enough to compromise the overall helpfulness of this as a starting point, I would guess. This is a spiny cell, with a decent amount of axon. Our gold standard does not include the axon for this cell, but I can still do a good comparison. Only one dendritic segment was missed, and it was partially obscured by the soma, so it is an understandable miss. The axon captured in the consensus looks great. This consensus would be an excellent starting point for us. It would definitely save us time compared with the autotrace as a starting point. There are a few false positives (not enough to be problematic), including the bubble edge that we discussed last month (and which Nova mentioned in a blog post on Mozak).